The product series of the JOHNNY FAMILY portable toilets has lived to see it's video presentation. Look at what is waiting for you in the individual portable WC, for whom they are designed and what additional equipment you can request. This year, the traditional purchase of new equipment applies not only to products such as portable toilets and WC, fences, party service or mobile offices. We also supplement and replace the fleet of service vehicles, in order to provide a 100 percent quality service. Brand new fully automated luxury trailer JOHNNY FIVE STAR***** has arrived to our warehouse. Our clients may look forward to the touch-free control of toilets and handbasin, sound system, air-conditioning and also LCD screen - even during hygienic brake, you won't miss anything from running event yet. Regular purchase of new portable toilets have brought one special change. JOHNNY SERVIS's premium toilet JOHNNY SUPER is now in new lime colors. This new fresh lime colors will be used exclusively for this toilet, in order to be visible, where events participants will get the best service. 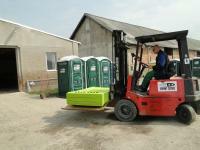 Brand new portable toilets are ready for the summer season! The first trucks full of new portable toilets has arrived in central warehouses in Liteň and Kuřim. Regular purchase contains toilets JOHNNY SPORT, JOHNNY LT and also JOHNNY SUPER with sink and flushing. After assemblage wil be a part of them sent to our subsidiaries in Slovakia, Hungary and Austria. JOHNNY SERVICE in cooperation with THT Policka (manufacturer of fire fighting equipment, www.tht.cz) officially launched a unique product - Trailer with complete equipment for flood protection. "For such unexampled construction we had to use advice of professional and volunteer firefighters and also our experience. Flood protection trailer will be part of the practical demonstrations of system Tiger Dam and we also plan to take part in exhibitions in the Czech Republic and other European countries. I'm very happy, we have got so many positive responses so far, it ensures me, that we are on the right way to offer complex services of flood protection to our clients, "said sales director at JOHNNY SERVICE Jiri Jenista. Since the beginning of the year, JOHNNY SERVIS is fully present on the market in Vienna region. 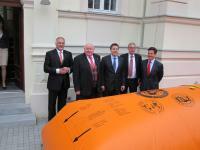 The opening in Mödling was attended by the mayor of the city of Mödling, Hans Stefan Hintner, the representative of the austrian chamber of commerce, Franz Seywerth and the citymanager of Mödling, Michael Danzinger. "We are here to serve our customers with the highest level of service when they are renting or buying products from us" said managing director Gerald Köllersberger, "satisfied customers are our best reference." Tiger Dam flood control system has proved its quality on the river Losenice. Unique road reconstruction was held just above small river Losenice. Due to the environmental requirements was not allowed standard repair. Therefore, the developer turned to us. "Thanks to great flexibility of Tiger Dam flood control system we could easily change the riverbed. Even in such conditions we were done with making new bed in a few hours and also after reconstruction there won't be any signs, that there was a temporary bed. As a result, we have fulfilled assignment and expectations of the customer. Tiger Dam is simply excellent!" Commented the whole fieldwork Petr Král, Project Specialist at Tiger Dam flood control system. "We are very pleased, that the realization of such a project demonstrated a quality of Tiger Dam anti-flood system, know-how and professionalism and skills of our team from JOHNNY SERVICE. 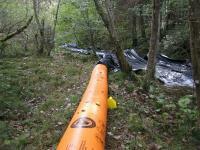 Over the next few weeks we will use this experience in a planning of the anti-flood systems in towns." Said Sales Director of JOHNNY SERVIS Jiří Jeništa. With our ambition to constantly improve the level and well-established standard of sanitation services once a year JOHNNY SERVIS Company enlarges their "fleet" of toilets with new products. "The philosophy of our company is to always provide something special. We have more customers for whom we want to provide better and better services and that is why we invest money in the purchase of new products every year. This year we have bought hundreds of toilets especially with sink and flushing. We believe that this is also way how our company can continue to move forward, "says Jiri Jeništa, Johnny Servis sales director. Slogan Water Against Water is associated with a unique system of flood defenses Tiger Dam produced by a Canadian company International Flood Control. The qualities of this system which is based on the fifteen-metre plastic cylinders filled with water linked together were presented on Tuesday to several dozens of politicians, members of municipal councils and also to rescuers by JOHNNY SERVIS representatives. This company is the exclusive distributor of these defenses in Central Europe. "We bought the first barrier about 15 years ago, we tried to fill them with water and left them outside the whole winter. They are fully functional even today, „says Matthew Duras, JOHNNY SERVIS CEO and thus emphasizes one of the strengths of flood plastic cylinders. Other valued features of Tiger Dam, at least in comparison with sand bags, which is still the most common protection against high water, are their flexibility, reliability, resistance to dynamic water effects, environmental friendliness and thanks to their ability to be reused also lower price. Also Jan Papež, president of the Czech Flood Association, describes Tiger Dam in his reference sheet similarly. JOHNNY SERVIS company participated again in the Prague International Marathon which is traditionally one of the most important sporting events in the Czech Republic. Johnny Servis provided approximately 250 toilets for men, women and handicapped athletes, changing rooms, tents, offices, and over five kilometers of fencing, which served to approximetely 10000 partiticipants in the Prague streets. "We are pleased to have made quality presentation of our company at this top event after several days of preparations ," says Matthew Duras, CEO of JOHNNY SERVICE. "As we have agreed on future coperation with the organizers, it is a commitment to future years at the same time." JOHNNY SERVIS have been providing technical services of the whole series of running races since 1997. JOHNNY Servis dedicated to portable toilets, sanitary trailers, mobile fencing, mobile offices and containers rent has spent many years striving for providing quality services and also for considerate approach to the environment. In 2006 in accordance with the International Organization of Standardization based in Switzerland the company was awarded ISO 9001 and ISO 14001 and four years later also ISO 18001 concerned with safety work principles. Recently the company has extended the certification from Tetín near Beroun to their branch in Hungary. JOHNNY SERVIS Company became a partner of this spring top cultural event in Slovakia - Depeche Mode concert in Bratislava. "We are really pleased to be able to meet the organizers demands and offer our sanitary trailers to the performers in addition to our standard products, such as mobile toilets, mobile urinals, mobile fencing and barriers or mobile offices," said CEO Matthew Duras. JOHNNY SERVIS is getting bigger: new mobile toilets, mobile fencing, service cars and new facilities. JOHNNY SERVIS company has invested tens millions crowns into improving their services and purchase of new products also this year. Most funds have been swallowed by mobile toilets, luxury sanitary trailer and mobile fencing. Further company development was enabled by the acquisition of new premises with an area of 10,000 square meters in the Liten near Beroun, which provides except for a new office building also large storage space and facilities for service and maintenance. One of the partners of the 12th annual Avon Walk Against Breast Cancer was also JOHNNY SERVICE company this year. They provided new exclusive toilets for women called JENNY for free for this event whose characteristic color is pink. JOHNNY SERVICE company, who rents portable toilets and mobile sanitary equipment, mobile fencing, mobile offices, storage containers and mobile flood barriers, was awarded as the second most successful company of 2011 in the category of small European rental with a turnover up to 15 million euros on 15 May in Oslo. In early April JOHNNY SERVIS company established cooperation with the League Against Cancer Prague which is engaged in cancer prevention and programs for improving the quality of life for cancer patients. Part of the profits from the lease of a new product - mobile toilets for women JENNY - will go to support preventive programs of this civic association. "The League Against Cancer has a number of programs aimed at women, whether in terms of preventing breast cancer or cervical cancer. We would like to contribute at leats a little to this important activity of the League Against Cancer," said Matthew Duras, CEO of JOHNNY SERVICE company.